Because cats are territorial animals that typically don’t like to stray too far from home, a stay at a boarding facility or kennel can be a stressful experience for our feline companions. In some cases, the stress of being temporarily relocated can even aggravate chronic health conditions and have a negative impact on a cat’s immune system. The good news is, with the right equipment, boarding facilities can make these experiences as comfortable and stress-free as possible for cats. 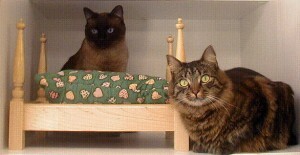 Take our hardwood trim cat townhouses, for example. With 28 square feet of living area separated into six separate levels, these shelters offer enough space to comfortably house up to three cats at once. Each cat will have plenty of room to retreat and relax in private, and they can find a litter box hidden away in a secluded compartment at the bottom of the townhouse. Our townhouses also feature a state-of-the-art ventilation system that’s designed to circulate fresh air into the shelters while eliminating foul odors and airborne bacteria. For added comfort, these townhouses can also be outfitted with cat-sized four poster beds. Our cozy cat beds include soft, washable mattresses that are available in a diverse selection of colorful patterns and designs. Thanks to their durable hardwood construction, they’re able to accommodate most cats weighing up to 16 pounds. If you really want to make your cat townhouse feel like home, you can add pillows to match the beds’ mattresses as well. Interested in learning more about our townhouses, beds or any of the other boarding equipment we offer at The Cat’s Inn? Feel free to give us a call or contact us online today!